Constituents: tannin, rosmarinic acid, allantoin, steroidal saponins, mucilage, inulin, pyrrolizidine alkaloids, gum, carotene, glycosides, sugars, beta-sitosterol, triterpenoids, vitamin b-12, protein, zinc. 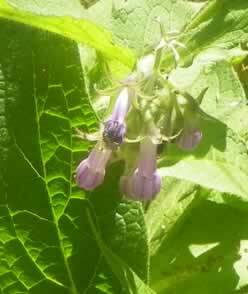 Comfrey salves, ointments and teas are best known for the topical treatment of burns, skin ulcerations, abrasions, lacerations, flea and insect bites, and just about any skin irritation. Comfrey's astringent tannins form a protective surface over wounds that promotes healing. You may want to try comfrey or allantoin skin creams for diabetic sores. For weeping eczema, make a tea of comfrey and apply the liquid as a compress. 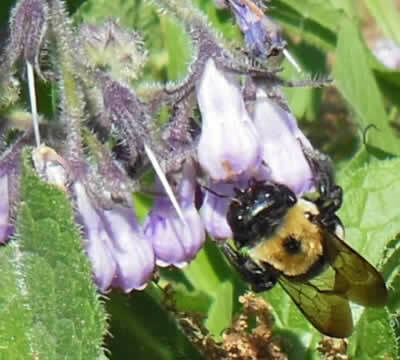 Comfrey relieves pain and speeds healing of pus-filled wounds, and accelerates tissue healing in cases of insect bites. Fresh leaves can be applied to bruises, fractures, sprains, and other injuries. Many healing effects of comfrey are attributable to allantoin, a compound shown to speed cell production both inside and outside the body. Comfrey works so fast that many herbalists will add antibacterial herbs such as goldenseal or thyme to comfrey salves to prevent sealing bacteria inside a fast healing wound. The evidence for the well established benefits of comfrey are such that you may wonder why are there so many cautions about taking comfrey. Many herbalists limit its use internally to short term applications while some go even further and warn against any internal use at all. In the late 1970s experimental data showed lab rats fed comfrey 3 to 4 times their body weight over a long period of time developed liver damage. It would take a human drinking 3 to 4 cups of comfrey tea for 140 years to achieve the same effect. (Duke,James, Ph.D.) Herbalists are divided on the use of this age old herb, on the one hand it has been used safely for centuries and on the other the pyrrolizidine alkaloids that are concentrated in the root and to a lesser extent the leaves have toxic effects. Speaking strictly for myself, I indulge in the occasional cup of homegrown comfrey leaf tea without undue worry, but in this you will have to rely on your own common sense and good judgement. Preparation Methods & Dosage :Comfrey leaf is taken as a tea, if you have access to fresh leaves, you can use them as a poultice or skin wash. Comfrey root is infused in oils and used in salves for healing skin. 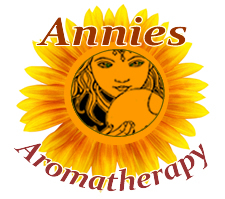 Comfrey salves, ointments and teas are best known for the topical treatment of burns, skin ulcerations, abrasions, lacerations, flea and insect bites, and just about any skin irritation. Fresh leaves can be applied to bruises, fractures, sprains, and other injuries. Compresses are an simple and fast way to use the healing power of comfrey on troubled skin. Soak a clean cloth in a strong decoction of the root or leaf. Apply directly to the affected skin area. Comfrey Side Effects: Internal use has become controversial due to the high content of PAs, however the be herb has been used by both humans and animals safely for centuries. (use your own judgement and common sense). Symphytum asperum, Prickly comfrey contains more of the pyrrolizidine alkaloids (PAs) than the common Symphytum officinale and should not be used. The most damaging studies are of the isolated extract symphytine, holistic use of the whole herb results in preparations containing much lower, if any amounts of PAs. Comfrey does best in part shade in dampish soils. If you grow it in the full sunshine, it will thrive in excellent soils that are well watered. Established plants self sow, and can be propagated by root division and cuttings. Seeds can be started in pots indoors in January for spring planting when soil temperatures rise. Barely cover seeds, needs light to germinate. To encourage good leaf growth, cut the flowering stalks back and use them to mulch the plant. Phytomedicine. 2007 Jan;14(1):2-10. PMID: 17169543. "Efficacy of a comfrey root (Symphyti offic. radix)"